***Price does not include freight and dealer prep. 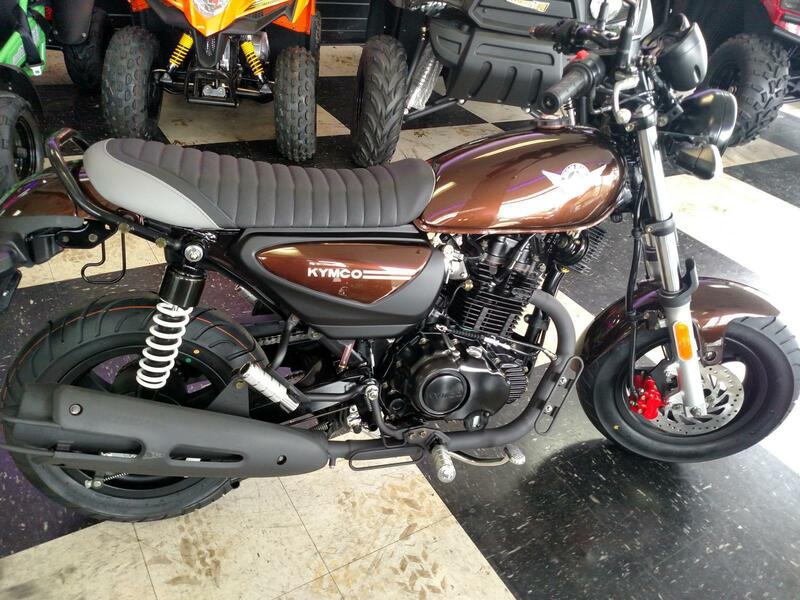 If you’ve had your finger to pulse of motorcycling, you might have noticed that lower displacement machines have been on the rise, but even more popular are the mini-motorcycles. Kymco, Taiwan’s largest scooter manufacturer, is keen on tapping in on that trend with the 2018 Kymco Spade 150. What these smaller machines lack in power, they make up for in the joy that they give virtually any rider who is fortunate to find themselves with a set of keys. Enough on that; let’s get to the Fast Facts. 1. The 2018 Kymco Spade 150’s motor is pure fun. 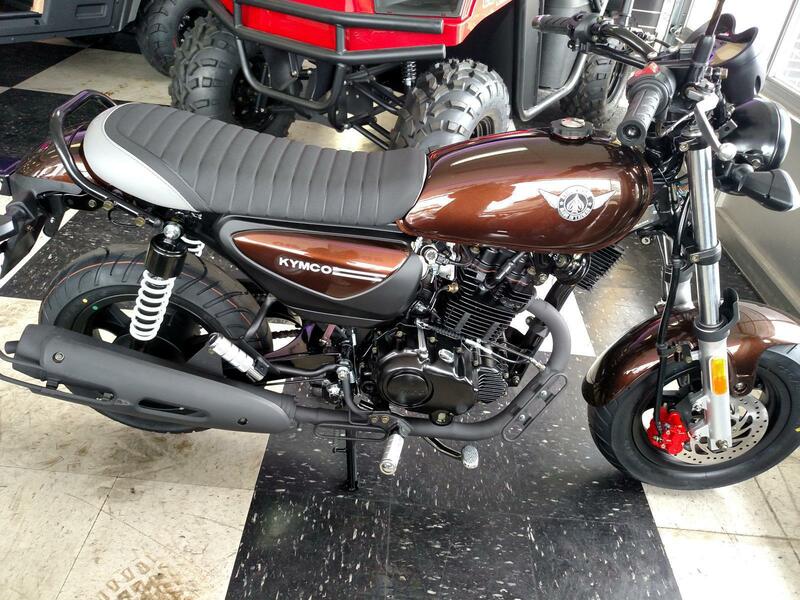 The air-cooled, SOHC, 4-Valve engine sits at the heart of this scamp-like machine. Peaking at around 12 horses and 8 ft/lbs of torque, the Spade’s EFI-fed powerplant pulls all the way through to the rev range. 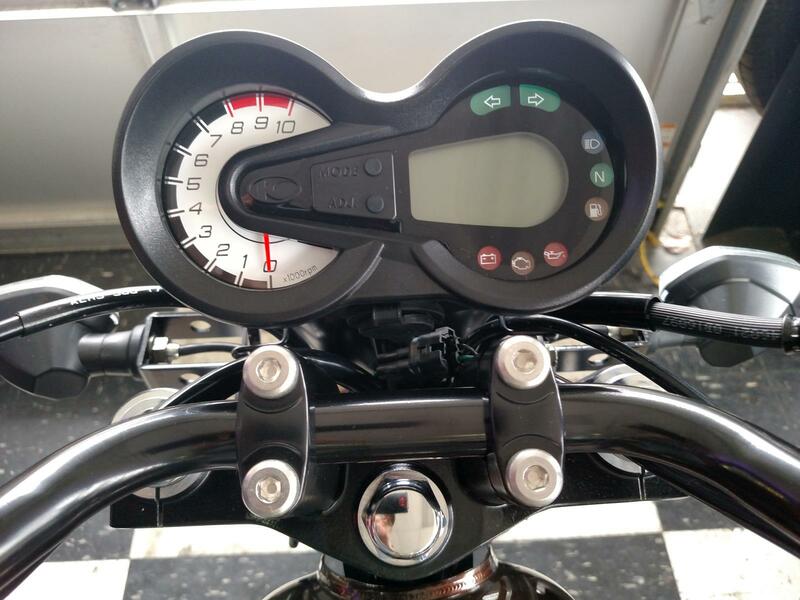 For newer riders, chopping the throttle or whacking it open in a corner probably won’t be met with unexpected or surprising results; it’s that forgiving. However, experienced riders will leap at the chance to use every bit of performance this little engine has. 2. 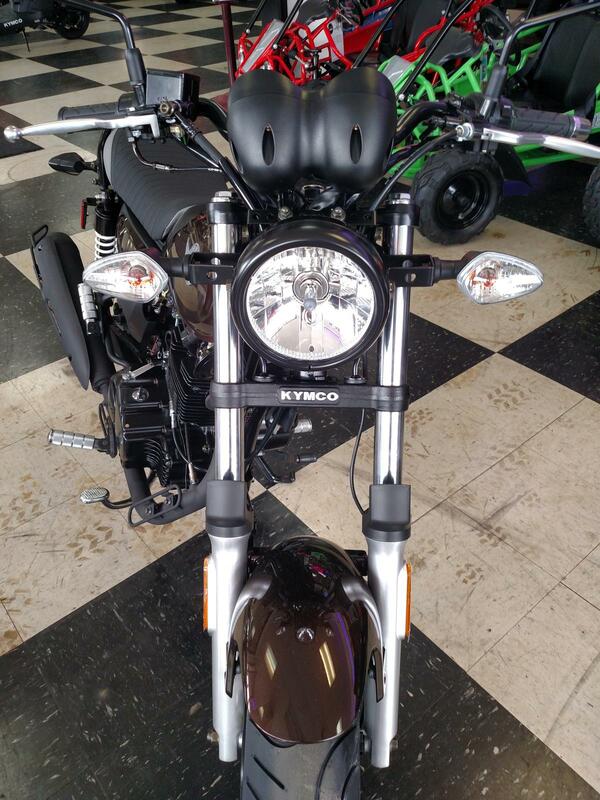 The Spade 150 has a traditional fully manual five-speed transmission. Geared for the street, the Spade’s shifting is on the stiffer side, requiring a purposeful motion when moving through the lever in either direction. It almost encourages a rambunctious approach to riding and with the feather-light clutch pull, I was happy to oblige. Once moving, the transmission takes to clutchless shifting easily, but can get a bit finicky when stopped. 3. Handling is undoubtedly one of the Spade 150’s greatest strengths. At a reasonably light 266 pounds, the Spade is remarkably agile and requires little input, thanks in part to the 47-inch inch wheelbase. Weight a peg and the Spade quickly complies with whatever suggestion you’ve made while also maintaining stability. Even abrupt inputs aren’t met with negative repercussions, meaning that novice riders will be able to become acclimated quickly. Whether you’re hitting a corner at a truly blazing 40mph or playing a game of “foot down” in a parking lot, the Spade whips into corners with ease. 4. When it comes to suspension, many riders will be content. Though the Spade is softly sprung, the suspension does quite well. Whether it’s a pothole, expansion joint or even when romping around in a dirt lot, the damping characteristics do well to settle the Spade 150 quickly. It should be noted that it also makes landings smooth, because when riding the Spade 150, every curb cut becomes an opportunity for low-level flight. Speaking of that, the Spade 150 is marketed in its home market as the A.I.R 150. 5. The Spade 150 might be small, but the riding position isn’t cramped. With a seat height of 28.1 inches, my 32-inch inseam allowed me to flat-foot at stops with ease. One concern taller riders often have with mini-motorcycles is comfort, and I didn’t experience any painful knee-bend issues. Additionally, the handlebars didn’t hit my knees while attempting to make tight turns. Save for the shifter, which forces your foot to be at a steep angle and takes some getting used to, all the controls are easily manipulated. 6. Budget brakes get the job done. Equipped with a single 220mm rotor up front and an accompanying two-piston caliper, along with a 140mm drum brake in the rear, brake feel is adequate. At the front, brake feel is linear, requiring only a single-finger pull in most cases. It requires a fair amount of effort to induce a stoppie or perhaps I’m just not good at them (probably the latter). The rear drum brake has a heavier feel to it, requiring a little more effort than those who are accustomed to disc brakes might expect. However, it can be modulated quite well, and will help you step the rear out while doing hood rat stuff with your friends. When not behaving badly, both brakes adequately slow the bike. 7. Classic styling seems to be the thread the Spade 150 is pulling on. 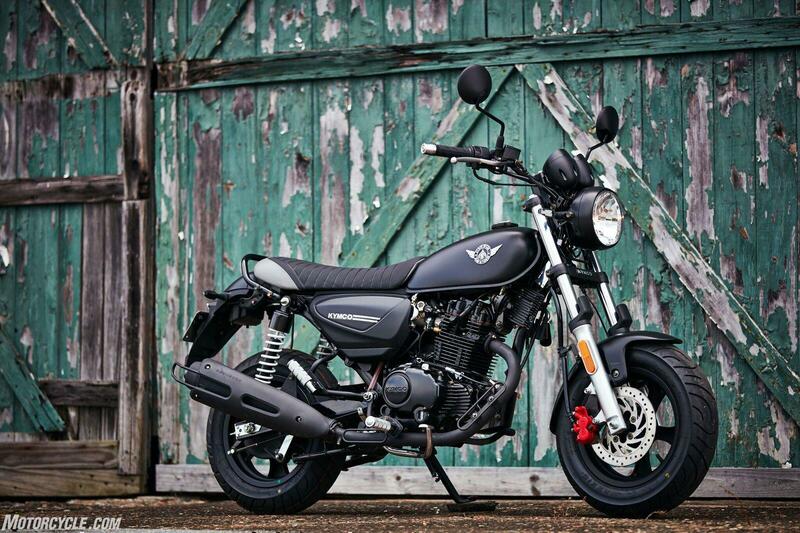 Unlike its direct competitors, the Honda Grom and Kawasaki Z125 Pro, Kymco has opted for a more timeless look when it comes to styling. A vintage-style steel tank comes with a retro badge proudly displaying “Kymco Spade” and “Made in Taiwan”. Combine that with a steel side panel and a long, spacious seat—room for two, passenger pegs are standard—and the Spade 150 has a something of a restomod vibe going on.